The stars Alnilam, Mintaka and Alnitak form Orion’s belt. Orion's Belt is an asterism of three stars that appear about midway in the constellation Orion the Hunter. The asterism is so called because it appears to form a belt in the hunter's outfit. It is one of the most famous asterisms used by amateur astronomers. Asterisms are patterns of stars of similar brightness. The stars may be part of a larger constellation or may be formed from stars in different constellations. Spotting the belt is actually one of the easiest ways to find the constellation Orion itself, which is among the brightest and most prominent in the winter sky. The three stars that traditionally make up the belt are, from west to east: Mintaka, Alnilam and Alnitak. The names of the outer two both mean "belt" in Arabic, while Alnilam comes from an Arabic word that mean "string of pearls," which is the name of the whole asterism in Arabic, according to astronomer Jim Kaler. Hanging down from Orion's Belt is his sword, which is made up of three fainter stars. The central "star" of the sword is actually the Orion Nebula (M42), a famous region of star birth. The Horsehead Nebula (IC 434), which is a swirl of dark dust in front of a bright nebula, is also nearby. Looking north of the belt, Orion's “shoulders” are marked by Betelgeuse and Bellatrix and south, his “knees” are Saiph and Rigel. Skywatcher Per-Magnus Heden wondered if the Vikings gazed at the same starry sky, which includes the constellation Orion at bottom, when he took this photo in Feb. 2011. “The only real legend that is sometimes referred to in Western Culture with Orion's Belt is the Three Kings,” said Tom Kerss, an astronomer with the Royal Observatory Greenwich, in a Space.com interview. This is a direct reference to the Biblical tale of the three kings who offered gifts to the Baby Christ shortly after his birth. Following southwest of the stars will lead you to Sirius, the brightest star in the sky in both the Northern and Southern hemispheres. Part of its brightness in the sky comes because it is so close to us, just 8.7 light-years away. Although the Orion Nebula has been studied thoroughly by both amateur and professional astronomers, surprises continue with further observations. In 2013, a Chilean European Southern Observatory telescope spotted signs of a cosmic "ribbon" in the nebula that is more than 1,000 light-years away. The track contains cold gas and dust, and astronomers also noted they may have found 15 young stars or protostars while making these observations. Even closer looks at the nebula have revealed features such as this bow shock from the young star LL Ori, which is sending out wind that strikes gas leaving the heart of the star-forming region. Learn more about Orion at astronomer Jim Kaler's Stars website. 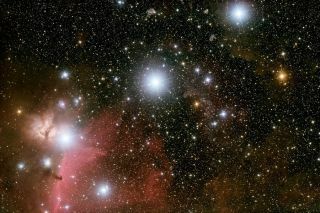 Another site, Chris Dolan's "The Constellations and Their Stars," also has information on Orion. NASA's "Astronomy Picture of the Day" features a beautiful image of the stars of Orion's Belt.